(77) Photos Printable Brochure Apply For Credit Schedule A Test Drive Text Us About This Vehicle! 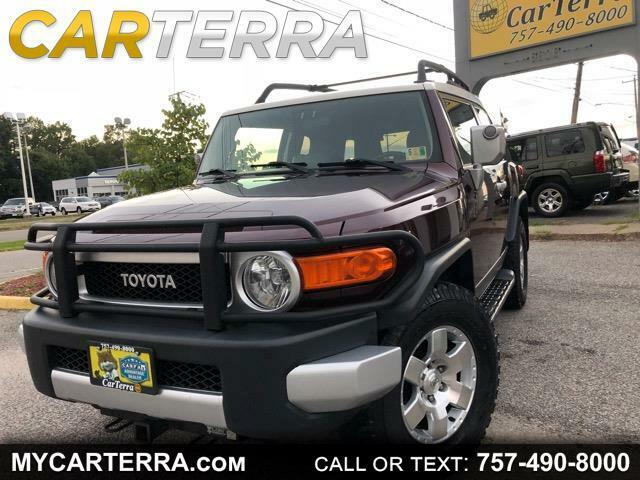 This TOYOTA FJ CRUISER 4WD AT - special edition, limited volume model is available as a 4WD model with active traction control, locking rear differential, off road suspension, stability electronics, AWD, skid plate, splash guards, electronic brake assistance, air conditioning, front power, full size spare tire, interval wipers, leather steering wheel, rear spoiler, second row folding seat, tachometer, cruise control, interval wipers, tire pressure monitor, power door locks, keyless entry, power windows, steel wheels, traction control, trip computer, cargo area tiedowns etc. Gorgeous Maroon exterior, no dents or scratches and the black interior is well-kept leather, clean, smoke-free. Drives smooth! Freshly serviced and inspected!! Clean Carfax, Unique Model, AWD and ready for a test drive today!